Definition - What does Sukhasana mean? Sukhasana is one of the most basic yoga asanas and is suitable for yogis of all levels. The name is derived from the Sanskrit, sukha, meaning "pleasure" or "comfort," and asana, meaning "pose." The pose is entered by sitting on the floor and folding the left leg until it is touching the right thigh. The right leg is then folded so that it touches the left thigh. 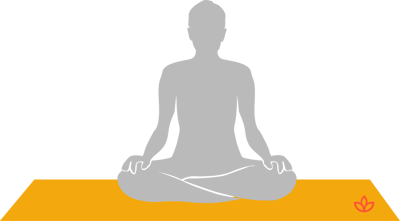 The hands are kept on the knees and it is common for yogis to use jnana mudra or chin mudra while meditating in this pose. The spine remains erect and the breathing is normal. Sukhasana is commonly known as easy pose in English. Benefits of sukhasana include opening of the hips and lengthening of the spine. It can also be used to ground the body and open the muladhara (root) chakra. In addition, it is a serene and calming posture that has been described as offering the route to spiritual enlightenment. To meditate or practice breathing exercises for long periods with this pose, it is important to keep the spine straight and properly aligned.